Extended lists match on source addresses and destination addresses as well as protocol information. <host source ip> Host ip address that sources packets matched by the list. <host destination ip> Host ip address that sources packets matched by the list. <destination network> IP network that packets are destined for are matched by the list. Uses Wildcard masks for matching. <tcp> Access-list will match TCP traffic. <udp> Access-list will match UDP traffic. <ip> Access-list will match all IP traffic. <eq> Equals a given port. <gt> Greater than a given port. <lt> Less than a given port. 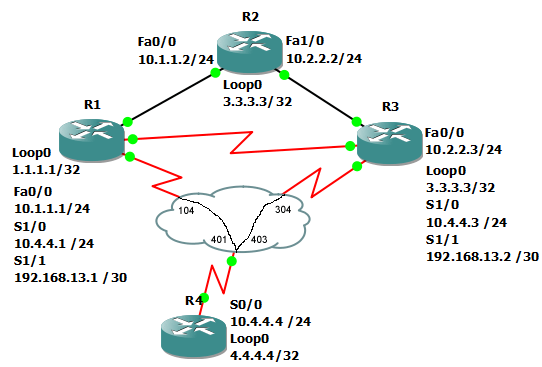 <range> A range between two ports. In this example, we will make an access-list that denies packets sourced by the host 1.1.1.1 and apply the list to R2’s Fa0/0. In this example, we deny any tcp packet that has a port number 1024 or higher.